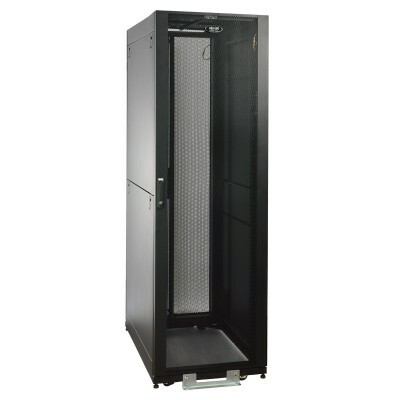 Tripp Lite's SR2400 Value Series SmartRack Enclosure Cabinet is packed with features designed to simplify rack equipment installations and rack equipment maintenance: top-panel cable routing ports, perforated doors to promote efficient airflow, adjustable mounting rails, toolless vertical PDU mounting and more. And as part of the SmartRack family, the SR2400 is compatible with Tripp Lite's extensive range of rackmount accessories, enabling you to customize your solution to meet any requirement. The SR2400 ships fully assembled for quick installation and comes with a 5-year warranty. â— Front and rear sets of equipment mounting rails adjust in 1/4" increments. Adjustment is quick and convenient. The easy-view depth index ensures consistent rail placement without requiring time-consuming measurements. â— Locking removable side panels are 'half size' to make them smaller and lighter improving ease of installation and servicing. Two side panels per side (4 panels total). Side panels are keyed alike to the front and rear doors. â— Convenient grounding system. All components are grounded to the enclosure frame which includes multiple connections for facility ground. Front and rear doors include quick-release ground wires.